You can also find this piece published on the Trade Show News Network here. 2019 is officially here and it’s time for you to make your mark in the exhibition world with show-stopping stand designs, excellent customer service and innovative ideas. But before you can start deciding on where or what to exhibit, you need to be clear on what you hope to achieve. By setting your exhibition goals for the new year, you can more efficiently develop your exhibition strategy and measure its success. We’ll take you through a simple process to help you determine what type of goals you should be setting and how you can develop them. What type of goals should I set? 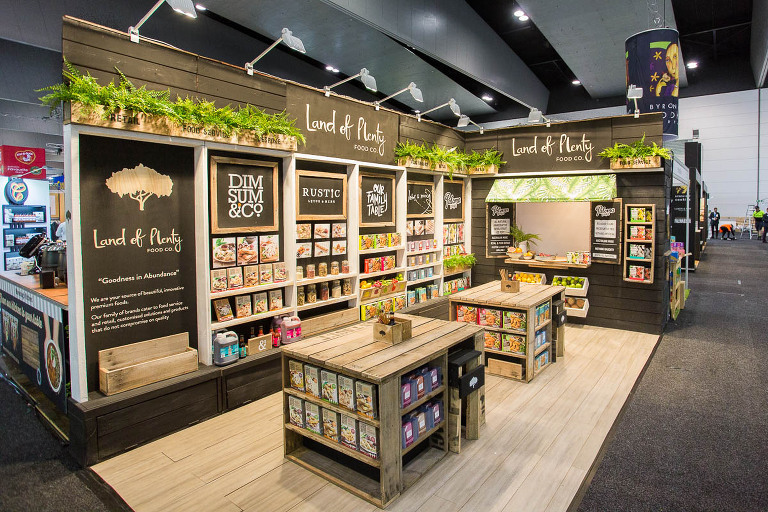 Exhibitions offer many opportunities to showcase your business and/or product to potential customers, but in order to do this effectively you must be clear on what type of outcome you are hoping to reach. Define the purpose for your exhibition and create your goal from there. This will help you determine the approach you should take when choosing a display stand design and interacting with stand visitors. Your exhibition display goals should reflect your overarching company marketing goals, not function independently. Consider areas that your business could improve or emphasise on and develop company goals based on these findings. Your exhibition goals will represent how you can achieve this company goal. If your company goal is ‘to increase profit margins’, then developing sales goals for your exhibition will work best. If your company goal is ‘to increase brand awareness’, then a communication focused goal will suit. If your company goal is to ‘identify a new target market’, then a marketing goal will generate the best outcome. Sales goals may be to ‘generate revenue’ or ‘conduct sales meetings’. Communication goals may be to ‘develop relationships with potential customers’, ‘enhance company image’ or ‘gain media exposure’. Marketing goals may be to ‘conduct market research’ or ‘introduce new products and services’. It’s important to stick to one goal at your exhibition. You don’t need to create goals that meet each of the three types. Often exhibitors will try to achieve multiple goals at once but this can risk spreading out your efforts too far and missing the mark entirely. Instead, focus on one goal for your exhibition and focus all your energy towards achieving it. At the end of the day, you want to be getting the most out of your exhibition and the best way to achieve this is through a clear and concise understanding of its purpose and your goals. Before you can start accomplishing your goals, you need to know how to set them. With one of the three types of goals in mind you can start defining what your exhibition stand objective really is. To do this we’ll take you through the SMART method for setting specific, measurable, attainable, relevant and time-bound. When setting a goal make sure it is exactly what you want to achieve. Be specific! The more detail you include about your desired outcome of the exhibition the better. You can determine the specifics of your goal by considering who, what, when, where and why. Your goals should be inspiring and exciting for your business, but they should also be achievable. You don’t want to risk setting yourself up for failure by creating goals that are not within your reach. Focus on how you can realistically achieve a goal – do you have the tools and skills required? If not, how can you attain them to help you reach your goal? Simultaneously, your goals shouldn’t be too easy. Make your goals realistic yet challenging to create the greatest business and personal satisfaction when accomplishing them. To increase your chances of achieving your goal it’s important to set a realistic deadline. This can help you manage your time and efforts more effectively. Ask yourself what can be accomplished within the time period and to what standard. Your timeline will depend on what achievement your goal is based on. For example, if your goal is to attract 100 visitors at your exhibition, your deadline might be by the end of the expo. If your goal is to gain 40 leads, then a suitable deadline might be a week after the expo to allow extra time for finalisation. A great tip for meeting a deadline is to set smaller deadlines within it that you can work towards throughout the process. Creating time-bound goals also creates a sense of urgency which can increase productivity. To create your SMART Goal, pull together each aspect we’ve discussed into one strong and concise statement. This statement does not have to address each component in order of the acronym, but it must include all five. Remember that different components of your goal, such as time frame and metrics, will be more detailed and specific to suit your own business. After you’ve set your SMART goals the next step is simple: stick with it! Write out your exhibition goals, educate your team and continue to work towards achieving them. Goal setting is an ongoing activity so make time for reviewing your goals and analysing their effectiveness. Don’t forget – set goals that motivate you! Your exhibition can be a fun and exciting way to boost your business as long as you are inspired and challenged to achieve results. If you're eager to get your expo adventure started, contact us on letschat@events720.com or click the 'Let's Chat' box below.